Final energy and energy transformations test - Monday, January 28th. work on the “Do Now” problem passed out inclass. 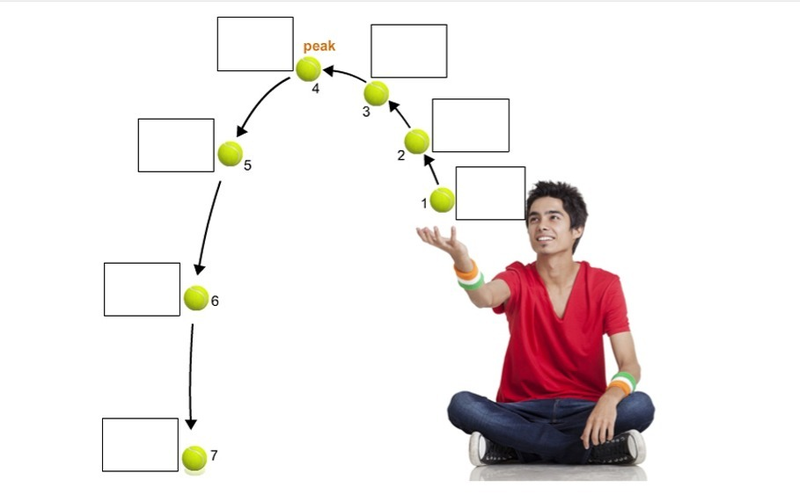 student tosses a ball as shown on the diagram. 1. What energy transformation occurs between the boy and the ball at position 1? 2. How much PE is gained by the ball as it rises to position 4? Describe this in terms of the energy the boy adds to the ball at position 1. 3. What is happening to kinetic energy and potential energy at position 5. 4. Compare the total energy at position 7 to the total energy at position 1. Explain how you can make this comparison with confidence. Copy the diagram below into your science notebook. you do not need to use identical colors. Define the problem: My hot chocolate gets cold too quickly! What constraints are you likely to face in solving this problem?